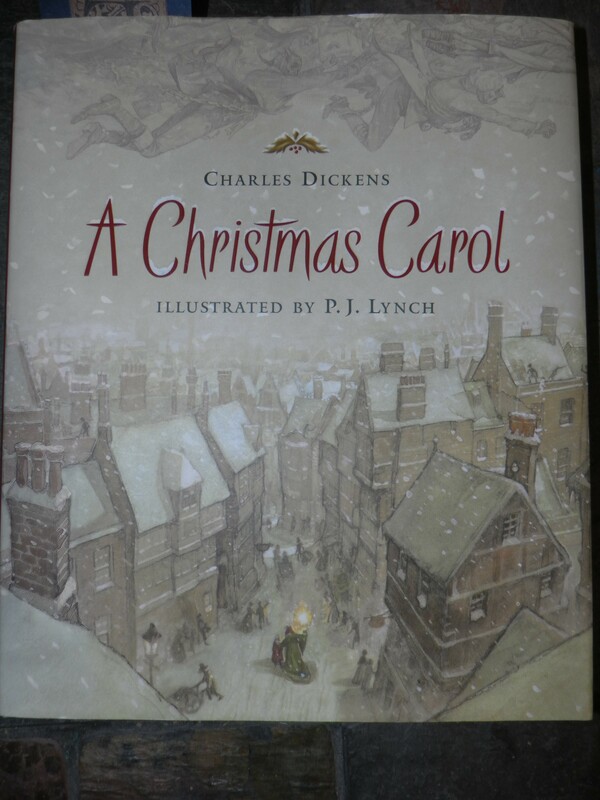 I’m reading A Christmas Carol to my six-year-old at bedtime every night. I could have picked up a children’s version for him, but I’m going with the original, even though much of it will fly over his head. I’m cheap and didn’t want to buy another version of a book I already own. I’m not a fan of watered down versions of books. If the boy opts for a children’s book, we’ll choose one that began as a children’s book. I think one of the parts that is the first to be cut in the children’s versions is one of the parts I most want my children to hear. Reasons 1 and 2 are self-explanatory. Let me explain reason 3. A Christmas Carol is a brilliant story. It wouldn’t have been made into a million different movies if it weren’t. There’s so much to love about it, and so much to like in many of its offspring films. But there is one thing that the original text has that nothing else does. The beautifully illustrated edition we read. The original has Dickens himself as the storyteller. I’m not just talking about his genius with words. I’m not just talking about his ability to set a tone or his command of the narrative. I’m talking about those instances when the narrator comes onto the page and speaks directly to the reader. This is an ancient form of magic, all but lost to us now. It is a relic of the time when children heard stories at their elders’ knees, when stories were enriched by the personality of the storyteller. You can’t do that today. We won’t stand for it. We want our stories delivered anonymously, not chuckled to us by a narrator who presumes to refer to himself in the first person. We don’t want it to smell of grandpa’s after shave; we want an antiseptic story to be beamed through the vacuum of space, like it is on TV. We want to be shown, not told. Now, I will be the first admit that some of the old fellows did too much telling. I will also agree that showing is far more effective than telling in our time, when much of the art of storytelling has been lost. But I will argue that there is a mix that includes both showing and telling that is the rarest treasure in the unveiling of a story. Dickens was a master at the mixology of show and tell. And who could appreciate show and tell more than a first grader? Okay, maybe a kindergartener, but what’s done is done. I want to offer my children the chance to hear the storyteller’s voice — to appreciate when a story is even better because of who is telling it and what his character adds to the telling. Maybe they won’t catch it this year, but there’s always the next. And besides Dickens, we’ve got lots of Hans Christian Andersen to get to. I read the entire unabridged version of The Chronicles of Narnia to my oldest grandsons, when they were a few years younger. They didn’t always understand everything, and I had to explain some, but they hung on every word, and so did I, as it was my first time as well. I, too, can’t stand cleaned-up, watered-down versions of classic tales. Sometimes it takes a while to get into the vernacular of the time in which it was written, but it’s always worth it. Learning the vernacular of the time is often one of the best parts of reading the book. It teaches children that the world is bigger than their own experience in it, and history didn’t start with them and their time. At least I hope it does, because those are valuable lessons.